Because we are always trying to expand our map selections you will find new products coming your way. And here is where we will introduce our new maps as we create them. Includes: Water Depths, Aids to Navigation, Local Names of Waterways, Fishing Areas, Street, 4-Color Fish Chart, knots and Much MORE! Size 22″ x 28″ 4 color. Waterproof, With Lat/Long Grid for GPS, Underwater structure, Water depth contours, Facilities Listing and more! 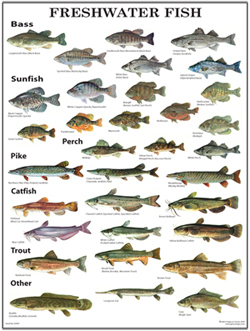 Featuring over 30 species shown in 4-color.. 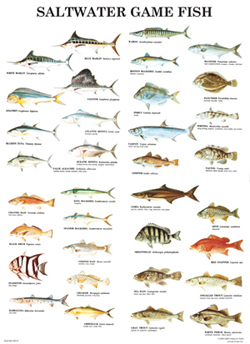 Featuring over 30 Species shown in 4-color. Order yours today, you can purchase the frame to go with this poster as well.